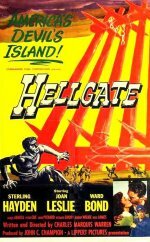 Hellgate is a remote prison in New Mexico where the brutal regime in the 1860s is made worse by the desert heat. Sterling Hayden plays the wrongly imprisoned veterinary surgeon, persecuted by the harsh and embittered commandant portrayed by Ward Bond, in this unremittingly grim production. Written and directed by Charles Marquis Warren, this low-budget western becomes too reminiscent of John Ford's much superior The Prisoner of Shark Island, and the true story behind it, when the vet's medical skills come in handy during a deadly epidemic.